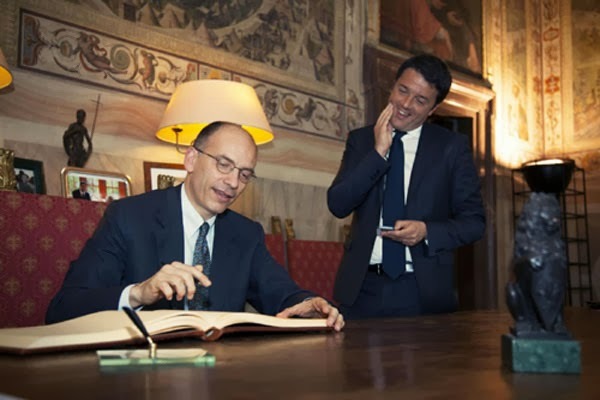 possibility of Prime Minister Enrico Letta handing over power to a new coalition government led by Matteo Renzi – the Mayor of Florence who was elected as the new leader of Mr Letta’s centre-left Democratic Party in December. The two are holding talks in Rome as we write this blog post, ahead of a key party meeting scheduled for tomorrow. Speculation is growing in some Italian papers that Mr Renzi already has a list of ministers in mind. The change of government would not change the numbers in the Italian parliament, where no party holds a majority in the Senate, the upper chamber. Renzi may be able to muster wider parliamentary support than Letta, but he would still be stuck with a diverse coalition with smaller centrist and centre-right parties – meaning that the difficulties in pushing ahead any significant political and/or economic reform would not evaporate. The handover of power would happen without an election, something which could backfire in terms of Renzi’s image vis-à-vis the electorate – not least because the Mayor of Florence has been clearly saying that he wasn’t keen on replacing Letta without a vote. Therefore, a better option at this point might be to pass a new electoral law quickly and call snap elections. The electoral law currently being discussed is not perfect, but it would make sure that the winning party/coalition would secure a solid majority in both houses of the Italian parliament. It could be done in time for the beginning of Italy’s rotating EU Presidency on 1 July. Indeed, this would mean two months of political paralysis because of the electoral campaign. But despite all the good intentions, Mr Letta’s government has so far hardly delivered on the big reforms it was supposed to implement. Most importantly, at the end of the process Italy would have a government which has actually come out of the polls – rather than negotiations among party leaders.